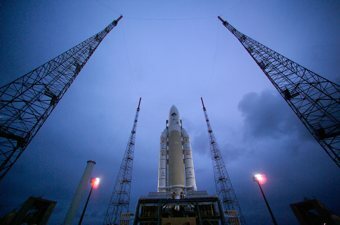 On 2 March 2004 at 08:17 CET, an Ariane 5 G+ booster rocket took off from the Kourou space centre in French Guiana. The mission: 67P/Churyumov–Gerasimenko. 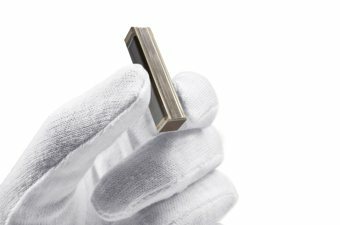 The payload: ESA’s 3-tonne “Rosetta” cometary probe including science experiments, the “Philae” lander – and8 piezoceramic multilayer actuators with a mass of 31.8 g.
Even at lift-off of the rocket booster 10 years ago, thepiezo actuators built into the “Philae” lander had to withstand the extreme vibrations and thermal shocks before leaving the Earth’s atmosphere. After achieving a near-Earth trajectory around the sun, “Rosetta” carried out several swing-by maneuvers persistently nearing its target: the comet 67P/Churyumov–Gerasimenko. According to plan, “Rosetta” was activated in January 2014 with the “Philae” lander being activated in March. After the meticulous and successful testing of all on-board instruments for their full operability, the probe will continue to close in on the comet from around two million kilometers to an eventual height of 10km. It is here that on 12 November 2014, a world’s-first should take place: “Philae” will detach from “Rosetta” and land on the comet 67P/Churyumov-Gerasimenko. 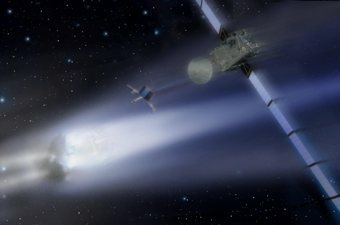 Both probe and lander will then explore the comet during its active phase together, providing ESA’s scientists with an insight into the chemical and isotopic composition of the early solar system. One of the instruments that will be used on the comet’s surface is the MIDAS (Micro-Imaging Dust Analysis System), a high-resolution atomic force microscope that can image the fine structure of individual dust particles and can even make individual atoms “visible”. MIDAS is to investigate the dust on the comet’s surface, analyze the mineral composition and if possible provide information about the age and journey of the comet.